On the most travelled week out of the year, it’s important to think ahead and keep your cool, as your careful planning is sure to encounter a kink or two. So, here we’ve gathered our own recommendations for you, on surviving the travel haze and arriving on Maui feeling nothing but the buzz of excitement for a fun-filled week to come! With increased foot traffic and endless crowds trying to get through jam-packed airport security lines (not to mention the extra baggage fees that all airlines seem to have now! ), it’s best to pack light for your week of tropical paradise. Most airlines allow you one bag and one personal item, so make ‘em count! Although it seems daunting to fly halfway across the ocean with only one or two small bags to your name, just trust us – you’ll quickly find it’s totally doable. Keep in mind that your destination is one of a very casual nature and certainly not known for ballgowns and heels. At almost every restaurant here on the island, you will fit right in with flip flops, shorts (or casual skirt/sundress), and a simple top. For the gents, maybe bring one button-down shirt, but just remember that you will most likely be living in t-shirts and shorts (or a bathing suit) for 80% of your time here, which should help with packing light! And with almost ALL hotels & Airbnbs, now including travel size shampoo, conditioner, and even a hair dryer in the price of your stay, you shouldn’t need to bulk up that suitcase with those heavy toiletries. Added bonus: skip that baggage carousel and head straight to the car rental windows, beating all those crowds! We know you’ve heard the stats, but just to reiterate… Thanksgiving week is THE busiest and most travelled week of the year, every year. With an expected 30.6 million flyers anticipated to hit the skies between 11/16-11/27 (up 2.1 million from 2017), it’s crucial to plan your travel days accordingly. For the least headaches, traveling ON Thanksgiving morning, or even the Monday or Tuesday prior, would be your best bet. Tuesday has also been found to be the cheapest travel day in terms of flight pricing, which makes it even more appealing. 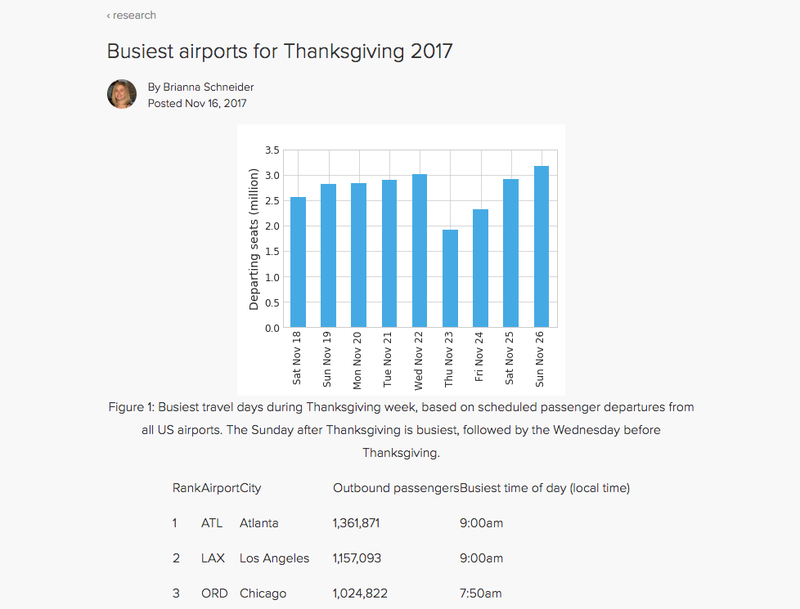 If at all humanly possible, avoid flying the Wednesday before Thanksgiving or the Sunday after Thanksgiving (the #1 and #2 busiest travel days of the year, respectively) or you’ll be sure to run into some frustrating times in that security line. Pro tip: booking your flight time as early as you can in the morning will be your best bet for an on-time departure, as afternoon & evening flights are affected by all those other earlier delays. Sure, you might have to wake up in the wee hours of the morning, but at least you can sleep on the plane knowing you’ll arrive in Maui with the most time to maximize! We know, it’s not fun to plan the TRAVEL for a vacation – we just want to be ON it! But your blood pressure level will be so thankful that you put in that extra time to make sure all your Thanksgiving travel details were figured out. Picture it: you’re packed, taxi is paid, and you’re all set to board the plane! Except… the 8-letter word that makes even the strongest-willed traveler cringe: S-E-C-U-R-I-T-Y. However, a few quick pre-travel-day maneuvers and you will be right as rain. First, know what items are allowed through TSA Security PRIOR to arriving at the airport. This will speed up your time spent in line and will avoid last-minute panicked shuffling of items between bags. Check the TSA website for current luggage regulations, or better yet, tweet @AskTSA for real-time replies from an actual agent. Don’t have Twitter? You can also send a Facebook message any time between 8a-10p on weekdays and 9a-7p on weekends & holidays to get quick replies to all your bag-packing questions. If you have an extra $85, we also suggest applying for TSA pre-check, which allows you to keep your shoes & belt on, and your laptops and liquids all snug in your suitcase. Pro tip: check Hopper.com to see their list of the 25 busiest airports in the U.S, along with the longest wait time per day in each airport, so you can plan accordingly for that security line. Psst: the #2 busiest on the list is LAX at 9am, a VERY common connecting airport when traveling to Maui. Definitely on the pricier end of the list, Merriman’s offers a Prix Fixe menu of culinary delights for turkey day, with the first seating starting at 12pm. Definitely need your reservations for this one! Adults ($85pp) and keiki ($35pp) will enjoy a savory mushroom bisque, a choice of six appetizer options – yumm, the hapa poke-ahi is the freshest you’ll find! – choice of main course and a dessert trio, complete with pumpkin cake. You can’t go wrong with any entrée on Merriman’s list, but we’re always a sucker for off-menu specials like the Roasted Organic Turkey with sausage-sage stuffing & gravy. Conveniently located right on the sand of one of the world’s most famous beaches, Ka’anapali Beach, Hula Grill offers an annual Thanksgiving Dinner with a “hula” twist, with seatings from 4:00-8:30pm. At a very wallet-friendly cost of $39 per adult and $16 per keiki, enjoy a menu reminiscent of tradition, with All-Natural Roasted Turkey, and spice it up with a Hawaiian classic – Kalua Pork with Green Apple Dressing! Finish out your meal with a yummy dessert, your toes literally in the sand, and some live island music performances. A nice bonus: their full regular menu is also available, if preferred! Enjoy jaw-dropping views as you stuff your belly full of delicious treats at this fabulous Thanksgiving Day Brunch, offered from 11:30am-2:30pm at one of the most luxurious hotels on island. Dry Aged Prime Rib with Sage a Jus, Wild Arugula Salad with Candied Hazelnuts, Crispy Duck Confit, and Sweet Potato Gnocchi in a Sage Brown Butter sauce are some of the (many) highlights. The cost will run you a bit higher at $98 per adult and $49 per keiki, but we promise you won’t regret it! A true gem in Maui’s upcountry, “the Store” is one of the most acclaimed restaurants of Chef Bev Gannon, boasting eclectic American Asian fusion culinary delights, made with fresh, local ingredients.From 12:00pm-7:00pm on Thanksgiving Day, feast on a 3-course meal with entrée options including Malama Farms Pork Roast, Braised Short Ribs with Kona Coffee Sauce, and of course, traditional Roast Turkey with a rich Gravy. Adult meals will run you $58pp, with keiki prices at a reasonable $28pp.Note: the regular lunch & dinner menus will not be available on Thanksgiving Day! Looking for a quick break from traditional Thanksgiving Day fare? A great option for a romantic, relaxing start to your evening is to climb aboard a luxury sailing catamaran that boasts wide-open, breathtaking views of the sun setting over the sea. Trilogy Excursions has two convenient departure locations serving both those on the West & South Sides of the island, making the 2-hour sail a convenient option for a few hours away from the hustle & bustle of the holidays. At $88pp, you’ll get 2 rounds of chef-plated appetizers and dessert to start your evening, as you & your sweetheart cheers to the open bar and sail off into the sunset! For all you visitors who love an active lifestyle, don’t you fret! Hosted by Valley Island Road Runners each year, Maui has its very own Turkey Trot which is sure to start your Thanksgiving day off with a good ol’ metabolism boost. Offering an 8-mile start time at 8am or a 16-mile start time at 7am, join all your running ohana at Harold W Rice Park in Kula for a morning filled with cool upcountry breezes, and warm Maui sunshine. There is a nominal cost associated with signups (race-day registration will cost you an extra $5), but the good news: EVERY runner, no matter how fast, is a contender for the unique awards determination, which allows participants to guess their own race time closest to their finishing time. The top 3 males & females closest to their actual race time – no spoiling the fun with device trackers – will claim the prizes! Register ahead here. Insider Info: Running not your thing? No sweat, we prefer some epic water sports, ourselves! Spend your Thanksgiving Day aboard with Trilogy Excursions on a snorkeling tour to Molokini Crater, nearby Lana’i island, or the crystal clear waters of Ka’anapali, all of which include breakfast, lunch & open bar! Book online, here. The Westin Maui Weilele Polynesian Luau takes a little departure on Thanksgiving Night, featuring a truly unique experience that blends Hawaiian fare with traditional turkey day fixin’s. From 5-8pm this one day only, feast on Harvest Thanksgiving Slaw with locally sourced green and red cabbage atop a Rock Salt Brined Turkey with Giblet Gravy! Local dishes also abound, and even a little Hawaiian style influences the traditional day’s stuffing, which features Portuguese sweet bread, sausage and sage spices. These are just a few mouth-watering items to enjoy as you watch an exciting journey through the Polynesian islands with song, dance, and lots of talking story. The newly revitalized Aloha-Pavilion is a gorgeous backdrop for you to relax with family and take in a once-in-a-lifetime experience of a Thanksgiving filled with tropical gardens, tiki torches, and of course, the fire-knife dance finale! Book either standard ($125pp) or premium ($145pp) seating online and get ready for a very special Thanksgiving Night! #8: Give Back & Malama Maui! What would a true Thanksgiving Day celebration be without embracing the essence of the entire holiday’s meaning?! 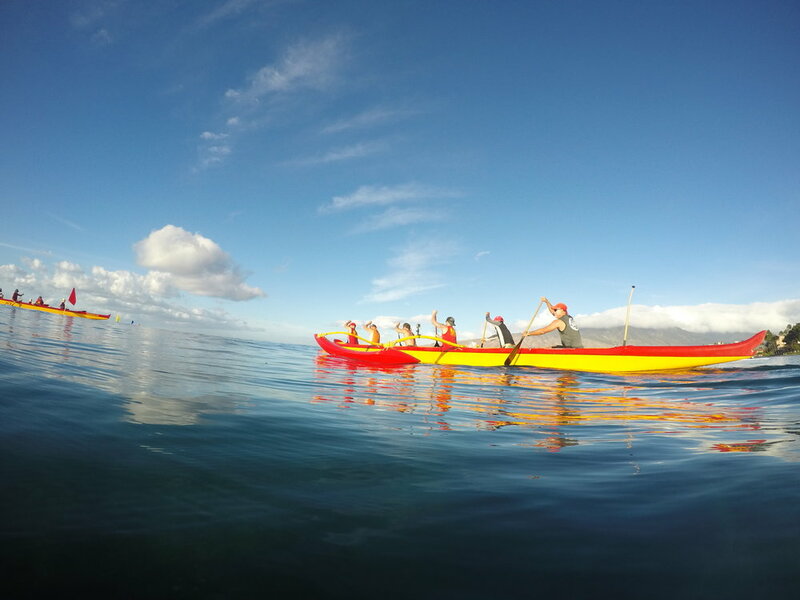 Each year, Hawaiian Paddle Sports gathers on Thanksgiving morning to celebrate the aloha in the community, hosting a Paddle For Hunger event at the Kihei Canoe Club in Ka Lae Pohaku Beach Park. Free to the public, registration starts at 7am, and includes door prize entries to every registrant, with the race beginning at 8am. Literally billed as an “anything that floats, jungle rules race”, this is a fun, family-friendly way to give a little something back to our beautiful island home. Participants are encouraged to bring one non-perishable food item to donate to the Maui Food Bank, and last year – holy COW were they successful! Raising more than $10,000 in donations and Silent Auction bids in 2017, this event also gathered over 1,000 pounds of food for the Food Bank, enough to provide 42,000 meals for families in-need around the island. Register online, and get ready to feel the true island aloha at one of Maui’s most-loved fundraisers of the year! So there you have it! An expert’s guide to navigating the jetstream and arriving on Maui relaxed, excited, and ready to experience the tropical Thanksgiving holiday of your dreams!